AUM is the Imperishable Word of GOD. Almighty GOD pronounced AUM with His Own Desire. AUM appeared as Supreme Divine Energy which helps in conduction of every known and unknown actions and reactions. Thus, AUM is the Supreme Source of Energy (SSE) i.e. GOD. AUM, being the GOD, is the beginning and end of all beginnings. 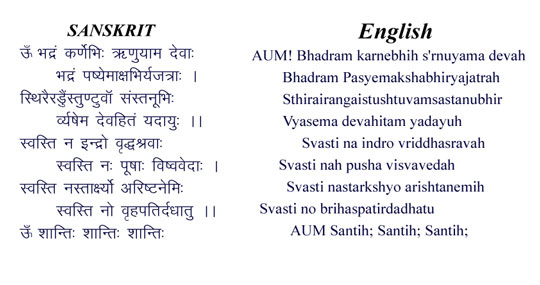 The under mentioned two verses are the prayer of AUM with deepest sense of divinity from beginning to the end. The great sage (Rishi) Maharshi Mandukya gave the physical shape of AUM which is the source of meditation and attainment of ultimate Goal. AUM! GOD, may we hear auspicious words with the ears; while engaged in sacrifices, may we see auspicious things with the eyes; while praising the GOD with steady limbs, may we enjoy a life that is beneficial to the GOD (in service to others). May Indra (the GOD of rain and ancient fame) be auspicious unto us; may be supremely rich Pusha (the GOD of earth for all creations as Brahma) be auspicious unto us; may Grauda (the GOD of destroyer of all evils as Shiva) be auspicious unto us; may Brihaspati (the GOD of welfare as Vishnu) bestow upon us auspiciousness.